Tomorrow is the day I’ve been looking forward to since the summer. On Thursday, EA will announce its third-quarter financial results for fiscal 2016. This the quarter that will include revenue for Star Wars Battlefront, the first Star Wars game from EA after the deal signed with Disney. Even though I work at the company, I’m not privy to any sales figures. The rumour is Battlefront did sell at least 13 million copies which is great since that was the sales target. It should have been a solid quarter for the company but I’m just lowly employee that doesn’t see all the figures. As many of you know, I’m holding onto a decent amount of EA shares, not enough to retire but enough to allow me to get extra fries at McDonald’s. Because of all the stupidity with China’s economy (when have those fools done anything right lately?) 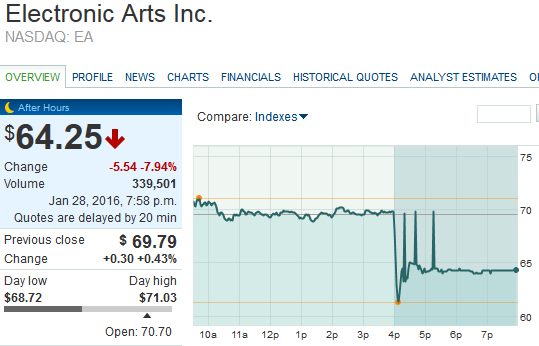 and the price of oil, EA’s stock price is mired at just below $70. My thought during the summer was that this quarter will push EA’s stock up to $80 but that seems unlikely now. The more likely scenario is that the stock will be in the $75 range, which unfortunately is where it was during the summer anyways. I’m leaning towards selling if it gets to $75. The uncertainty of the economy with oil prices and China’s bumbling makes me think I should get out while I still can. On the other hand, if this latest quarter doesn’t excite Wall Street, I may just hold onto my shares. Patience is what got me to this point and it’s paid off so far (theoretically). I could have sold all my shares in the summer of 2012 when the stock was around $12 (which some people did) but I waited because I could. Is this where I finally cash in all that stock? I’ll know starting 6am PDT on Friday, when Wall Street reacts to the latest earnings report. As many of you know, I’m looking forward to the end of my current employment contract. I really need some time off to sleep in and do whatever. I’m really good at sleeping in and doing whatever. After the hard work of finishing a video game, sleeping in and doing whatever nourishes the soul, at least my soul. My original end date was going to be the 26th of February but it looks like it’s going to be earlier. No, they’re not ending my contract early. I’ll still be paid until the 26th but I just don’t have to be at work. This is the much-loved “comp time” that seems to be exclusive to the video game industry, the reward for working OT during the project. Someone threw out a date of how much earlier I can leave but I just need to make sure that date has been agreed upon by all parties. If that date holds true, I won’t have a lot of time left which is totally awesome! I’m already thinking about how good it will be to spend all day in my PJs eating fried foods and playing video games. I really need a new pair of shoes. I discovered in the fall that my favourite pair of skateboarding shoes had several holes in each shoe. Then I found out that my comfy pair of slip-on loafers also had holes. I was left with my canvas Converse Chuck Taylor’s and a pair of hiking shoes. For a while there, the hiking shoes were the only shoes I could wear outside if I didn’t want to get my feet wet. I eventually bought a new pair of loafers but as for somewhat water-resistant casual shoes, I had none. I tried getting a new pair of skateboarding shoes but either the fit wasn’t right or I didn’t like how they looked. I tried for weeks but I just gave up. Now in the new year, I’ve decided to try again. Looking for new shoes online is easy but it can never replace trying on a shoe. I’ve seen dozens of shoes online but how can you buy a pair with any certainty that they’ll fit the way you want them? I’ve bought a lot of things online but shoes remain in the unbought territory. I had a dental filling re-done on Saturday. I’d been told since the early fall that one of my fillings had cracked and needed to be replaced. Since it wasn’t bothering me and I was really busy, I left it until now. The original filling was a shiny metal one and I probably got it when I was a kid. It’s been decades now and I suppose it’s a testament to dentistry and my old dentist that the little bit of metal in mouth has stayed there that long, mashing all the terrible food that I’ve eaten. I can’t remember the last time I had a filling though. I’d say it would have been many years since the last one. It’s not because all my teeth have already been filled either. I try very hard to maintain proper dental hygiene. I have two checkups a year at the very least. I also brush twice a day and floss at night. The flossing part is something I picked up about five years ago. I never flossed as a kid nor when I was a much younger man. It was just something I never wanted to do. I can’t imagine not flossing now, especially when I see the chunks of crap that sometimes the floss extricates from my teeth. Yikes! Anyways, getting the filling done was relatively painless. The needle didn’t bother me, nor did the drill. Keep in mind, it wasn’t like a day at Disneyland either. I’ve also had two gum flap surgeries done since the filling previous to this one. Do yourself a favour and don’t look for videos on YouTube about that procedure. So yeah, a filling isn’t bad at all. They went with a composite filling this time, meaning no metal and the colour matches the rest of the tooth. It’s still weird seeing a normal looking tooth now instead of that shiny metal patch. Today’s jaunt out to the airport to meet my friend was a success. Not only did I save $2.50 in extra transit fare, taking the bus probably got me to the airport just as quickly, if not slightly faster than taking trains all the way. Unfortunately, I may have stayed up too late the night before and did not get enough sleep. I fell asleep on the bus on the way home, which allowed me to be alert enough to run some errands in the afternoon. By 9pm though, I was feeling very tired. I probably should have forced myself to stay awake but I love making the wrong decisions and took a nap instead. My intention was to nap half an hour or so and I probably should have set an alarm but I did not. The next thing I know, it was midnight. I’m wide awake and very refreshed now. I’ll probably take a sleeping pill so that I can get some rest before the sun comes up. For the last four days the public had its very first chance to play the game I’ve been working. The free multiplayer beta was designed to be a small taste of what players could expect when the game hits the digital and physical shelves in February. Whenever the public first plays a game you’ve been involved with, it’s difficult to know what to expect. I maybe biased but I think the game is pretty good. I’ve made a few games in my career now and this one certainly is up there in terms of quality. It’s not perfect but I’m proud to have been part of the development. As people started playing the game though, I was initially a little bit surprised to see some negativity from parts of the Internet. Based on just a few hours of playing and a fraction of what the full game offered, some people were already categorically declaring the first game was better in all respects. I’m not sure who reads the first chapter of a book and then decides the previous book was better, including the end. Other people complained that we added too many new characters. I’ve rarely witnessed players complaining that a team added too much content for a sequel. From that complaint, I can only surmise they wanted us to actually provide them with less content. Really? Some people said that they were confused by the new maps and they didn’t know where to go and where the best paths were to objectives. They said they preferred the first game where they knew exactly where things were in the old maps. I wasn’t sure if I was even reading this correctly. We gave them something completely new and they were complaining they’d never seen it before and thus the first game was better because they already knew those maps. I could have easily become disappointed by all of this but then I reminded myself of all the lessons I learned from the previous games I worked on. People who write comments on the Internet are more motivated to do so if they have a complaint. If something works or people enjoy something, they are more apt to just keep enjoy that something instead of putting it down and getting on the Internet and telling the world how great it is. I’d like to think that for every one negative comment we got, ten people were busy having fun. I then saw some of the more useful, constructive criticism that other people began to write. This is the stuff that is like gold for us developers. I saw comments on character balancing, tweaks for the HUD, and suggestions for the maps. These are actual actionable type items and stuff the whole team appreciates. The real reviews will come in February. I can’t wait for those!